Green eggs and ham anybody? Mrs WDC arrives at midday with our two-year-old granddaughter and announces, ‘Look, here’s grandpa – and we are very hungry!’ WDC kicks into action: what’s in the fridge? Leftovers; including fish, mushroom sauce, potatoes and a fair amount of spinach. You see where this is going? 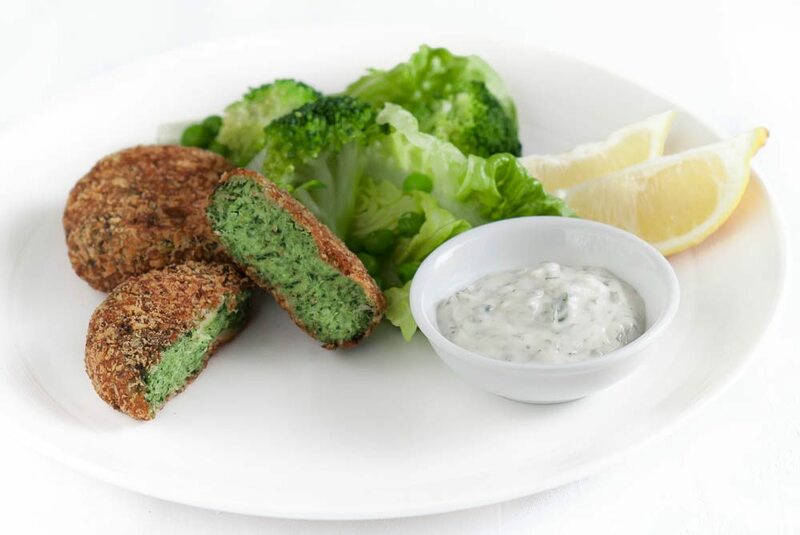 When all the leftovers were whizzed in the processor – out came the mixture for green fish cakes. NB: This recipe does not use any egg to bind the mixture. The waxy nature of the potatoes will make a gluey puree when worked after mashing or ricing. This tendency helps to bind the mixture without egg. If your mixture is robust and stiff, the resting time can be reduced or eliminated – see story below. Prepare the fish. Heat the oven to 160C Gas 4. Wash and dry the fish. Place on a baking tray and roast for 15 -20 minutes or until the fish is opaque and flakes easily. Place the fish in a shallow bowl – draining it over the tray with a spatula. Tip any liquid into a separate bowl and set aside. Cook the potatoes. Wash the potatoes keeping the skins on. Place in a large pan of salted water and bring to the boil. Cook for 15-20 minutes until very tender. Drain and leave to steam and dry. Cook the spinach. Wash the spinach and drain. Place in a large pan without extra water. Cook on a high heat stirring all the time. When boiling and wilted, take off the heat and drain. Allow to cool by spreading out onto a tray or large dish. Put the spinach in a strainer and push out the excess water with a spoon. Alternatively squeeze in your hands until all the liquid has been released. Make a sauce. Chop the shallots and the mushrooms. Fry them both in a tablespoon of butter until soft, increase the heat and add the wine (if using) until it has reduced by a half. Add the chicken stock, liquid from the roasting tray and herbs and simmer rapidly allowing it to reduce once again by half. Add the cream and simmer gently for 1 minute. Taste for seasoning and add a squeeze of lemon. Make the fish cake mixture. Rice or mash the potatoes. The skins will collect on the ricer or masher and can be picked away – either include for extra flavour and roughage or discard. Work through the fish with your fingers flaking the fish and removing any bones and skin. Using a food processor, make the fish mixture in stages, combine equal amounts of fish, potatoes, spinach and sauce and blitz until just mixed. Stir to combine the mixture and using your fingers and hands form the mixture into patties – about 6cm x 2cm. Place these on plates and refrigerate for half an hour – longer if possible. Coat the patties. Put the flour, beaten egg and breadcrumbs in separate bowls. Take each fish patty and coat in flour, then egg and then breadcrumbs. It helps if you have one dry hand and one wet hand. Work your way through the patties and place on plates. Rest these in the refrigerator again for half an hour – longer if possible. Place the oil in a large pan with high sides and heat to 180C. Using a slotted spoon carefully put three or four fish cakes into the oil and fry until golden brown. Drain on paper towels. Serve with a green salad, sauté potatoes and lemon or tartare sauce.